Philips unveils Fidelio E2 Bluetooth speaker system | What Hi-Fi? The Fidelio E2 speaker system features NFC connectivity and supports aptX Bluetooth. It can be coupled with a TV, PC or games console. 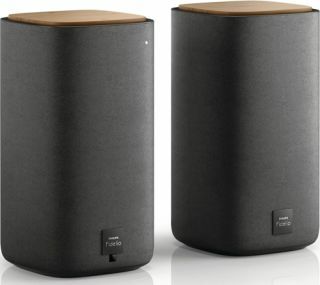 Philips has today announced the new Fidelio E2 Bluetooth speaker system - two wireless speakers that can be connected to a TV, PC or games console. Portable devices can be connected via NFC (Near Field Communications) with those that support it. Other devices can connect via aptX or AAC Bluetooth. TVs and games consoles can be connected via the HDMI ARC – Audio Return Channel – connection and PCs using optical/coaxial connections. Users can also connect non-Bluetooth devices via the 3.5mm input on the rear. The E2 is a two way bass reflex speaker and comprises a 1in silk ribbon tweeter and a 4in woofer and bass reflex system. Philips claims this will provide a "smooth, warm sound with wide dispersion" and "powerful, deep and detailed bass". A minimalist design, the E2 is a mixture of charcoal grey cloth and natural wood end caps. These caps also allow the user to change the volume simply by tapping them. Power and source controls are placed on the speakers themselves. The Philips Fidelio E2 Bluetooth speaker system will go on sale in March for £300.